In 2010 our family was one larger than normal and I wanted to do something for Halloween that would involve all of us. 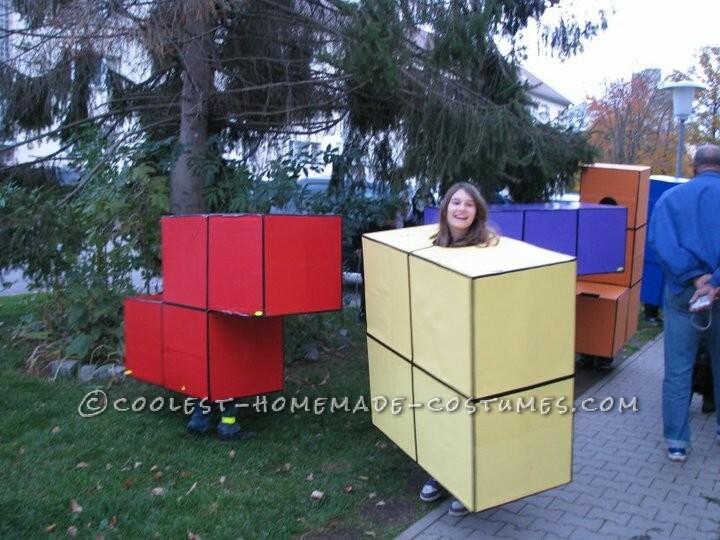 This is when I came up with the idea for a life-size Tetris family Halloween costume. To start I began researching the shapes and colors and drawing them out, trying to figure the best way to make 5 shapes fit. Once I got the basic plan in place, the construction effort began. I started with ordering thirty 50cmx50cmx50cm boxes. I figured that they were broad enough for my shoulders, they should be fine for everyone else. I then got a lot of duck tape and just started taping boxes together, ensuring that I was still getting them as square and as sized as I could. My original thought for coloring was to spray paint them, however, I quickly discovered that spray paint and cardboard do not look so well together. It just so happened that I had to get some wrapping paper for someone’s birthday and discovered the solid colored papers. The blue L, red Z, purple T, and blue I were all wrapping paper, though I could not find orange and yellow. I then came across an orange roll of disposable tablecloth (good thing for fall decorations) at the local retail store and decided that yellow poster board was good enough for the O. With some spray on glue and a huge mess in my dining room, they began to take form. I then used black electrical tape to create the lines. On the inside I made shoulder straps from duck tape, stretching it from side to side and reinforcing them against the wall as much as I could. I later found that the humidity of our sweating bodies and the constant bouncing was a bit too much for the tape to cardboard. I figure if I ever do this again, I will cut a slit and run the duck tape straps from the outside before I place the paper on them. 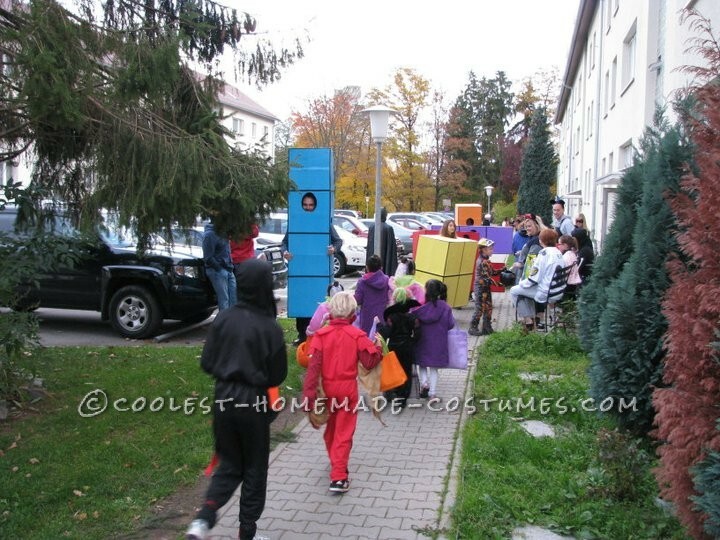 Since this is trick-or-treating, all of them, except the I, had an opening in one of their empty boxes to collect candy. To top it all off, I had a battery operated speaker in the O, since she had like a shelf on the inside, playing various forms of Tetris music. These costumes were so big that I could only transport two of them in my van at a time. Luckily I worked on the post in which we were going to be trick-or-treating on, so I took them into work and stored them there until the day. Throughout the night we were constantly being asked to stop and form up. People were taking pictures of us from all sorts of angles. Many people caught on to what we were right off the bat, some just referred to us as blocks, Lego’s, or one even called us Rubik’s Cube. It was an amazing night, but at the same time, a rough one. The two younger children, 8 and 9 at the time, became tired early, and as they continued to complain they would bounce their costume and destroyed their straps even earlier. Before we even walked half the area and still had plenty of time to go, they were done. All in all though, I still get comments to this day on how awesome it was.